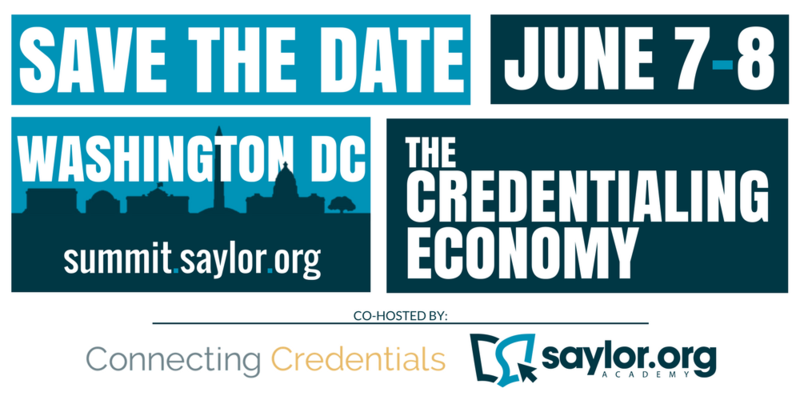 Saylor Academy and Connecting Credentials are joining forces to host the Summit on the Credentialing Economy on June 7-8 in Washington, DC. This Summit will convene decision makers in higher education, policy, and human resources, as well as funders, providers and employers to go beyond examining the problems in the credentialing marketplace: participants will learn about innovations underway, actionable strategies to improve the learning economy and will work together to tackle the most vexing problems. Those interested in attending/receiving updates can sign up at summit.saylor.org and follow #CredEconomy on Twitter. Tech is blurring the boundaries between teaching, training and learning and AR, VR, AI, and Blockchain are leading the way. We are on the cutting edge of how disruptive tech is changing the way knowledge and skills are acquired, validated and used in the labor market. The shift toward granularity in knowledge assessment. What underlies the credential? Skills? Competencies? How could micro-assessment movements change how we hire, promote and educate? How will teaching have to change to support new credentials and industries? Will a growing acceptance of expanded toolsets (CBE, OER, microlearning, etc.) lead to more confusion or more clarity about what a student/applicant can do? Discuss tools, HR practices, assessments that can verify and demonstrate trust for credentials for all participants in the market: employers, industries, educators and applicants/students. The Summit will take place at the FHI 360 Conference Center in Dupont Circle, Washington DC. Saylor Academy is an educational nonprofit initiative, providing free online courses that transfer to college credit and degree programs. Saylor Academy partners with colleges and universities to foster credit acceptance and degree pathways, with nonprofits to encourage access to education, and with employers to support degree completion among working learners.